Braig asks Young Xehanort which of the former Organization XIII members shall be chosen to become Master Xehanort's next vessel. "Destiny" is an additional secret ending in the Kingdom Hearts HD 2.5 ReMIX version of Kingdom Hearts Re:coded. It uses engine-style graphics and voice acting, ending with the phrase Reconnect. Kingdom Hearts. This secret ending does not tease a future Kingdom Hearts game; instead serving as a connection to the events of Kingdom Hearts 3D: Dream Drop Distance. 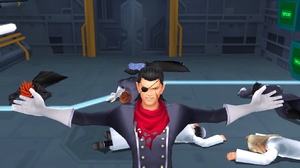 In Ansem's computer room in Hollow Bastion, Braig, Dilan, Even, Aeleus, Ienzo, Isa, and Lea return to their human forms as a result of the destruction of both their Heartless and Nobodies. Everyone except Braig is unconscious; Braig speaks to Young Xehanort and deduces that the absence of Master Xehanort despite Xemnas's destruction means that the elderly Keyblade Master has already put his plans into action. Braig is unsure of Master Xehanort's intentions, and Young Xehanort, who is also unsure, tells his accomplice that Keyblades are passed down by their wielders to their apprentices from generation to generation. Xehanort emphasizes the importance of the Keyblade that he will wield one day, and knowing that the weapon is somehow connected to the Keyblade War, Braig decides to accomplish his own goals. He contemplates who to take along with him, and Xehanort begins to speak Saïx's name. Xemnas and Master Xehanort are mentioned. In order to unlock "Destiny", the player must have watched all the cutscenes for Kingdom Hearts Re:coded in Kingdom Hearts HD 2.5 ReMIX. This page was last edited on 30 March 2019, at 23:52.